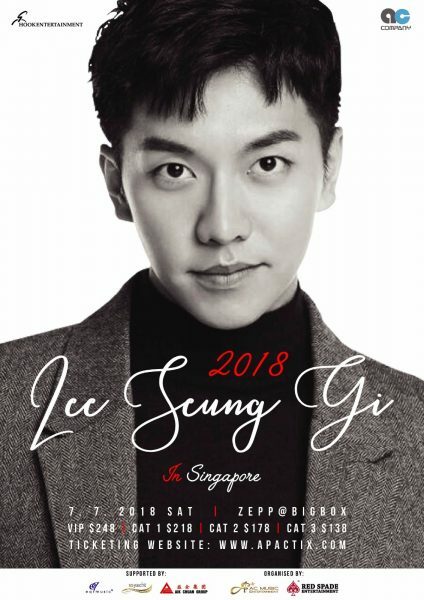 The last time Korean star Lee Seung-gi graced Singapore with his presence was in September 2013 for a fan meet-and-mini concert. During that period, he was also romantically linked with Girls’ Generation’s Yoona. That relationship lasted until 2015. Five years later and possibly single, 31-year-old will make his return to Singapore this July for another fan meet. He’s also fairly fresh out from the army, having only being discharged from the country’s compulsory military service in October 2017. Now back in the spotlight, Lee Seung-gi didn’t miss a beat and picked up where he left off by starring in a 2018’s widely-successful “Princess and the Matchmaker” and the highly-raved Netflix drama “A Korean Odyssey”. No details were released on the breakdown of Lee Seung-gi’s fan meet. But seeing how he rosed to fame in 2004 by starting out as a professional singer, with hit singles such as Will You Marry Me, Because You’re My Woman and Return under his belt, we’re kind the good-looking crooner will indulge his fans with a song or two. The fan meet will take place at Zepp@Bigbox, on 7 July 2018, 7pm. Tickets are from $138. For more information, visit facebook.com/redspadesg.